Planeswalkers for Diversity was at PAX again this year, in the Diversity Lounge where we will be set up to teach new players to play Magic and to answer questions about setting up local chapters. This year we will also have buttons and these two playmats available for purchase! Several Planeswalkers for Diversity volunteers assisted a crew of people from our sister organization, Lady Planeswalkers Society, teaching new players to play Magic. Friday, September 2nd at 4:30pm in the Chipmunk Theatre. Gaming has a problem with being inclusive and with diversity. While industry is working on it, discussion can generate an ideological divide. We will start to move beyond this with good, hard data: demographics, how often people have unwelcoming experiences, what impacts that has, and how people have made change. We will involve the audience to check our collective assumptions and see what quantitative empirical evidence says about diversity in gaming and about how to improve inclusivity. Hello all. For those of you who do not know me, my name is Lucas (often known by my Twitch moniker ‘MrLuBuFu’). 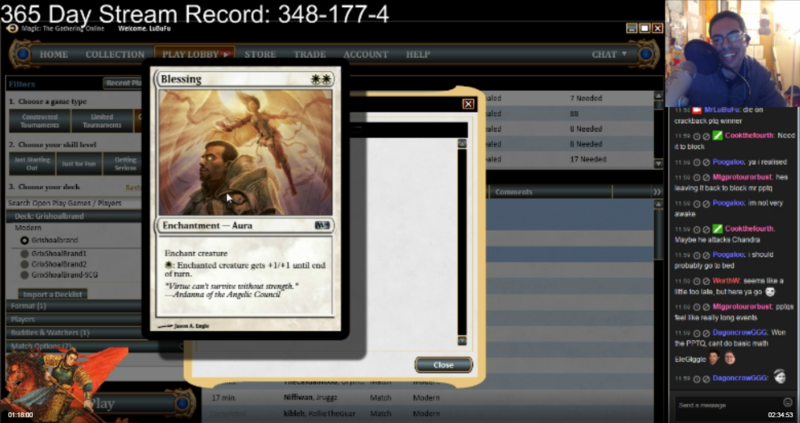 Almost a year ago, I decided to challenge myself to stream Magic the Gathering: Online every day for 365 straight days. I wanted to do this not for viewership numbers nor popularly, but rather to put a difficult goal in front of me and see if I could persevere for both myself and any viewers of my channel. As a content creator on YouTube for over five years, I have found personal connections and interactions with the community can form a true bond between people. I wished to build a space where anyone could come in and be comfortable enjoying a technical analysis of Magic. Now I find myself facing my final day of this challenge staring me down, I felt it would be appropriate to share my thoughts, experiences and thanks to all I have interacted with during the process. The 365 day stream challenge is really, really hard. I recall mentioning to Kenji Egashira (NumottheNummy) that I was undertaking the same challenge he had completed. His response was honest: “Good luck. It’s going to be rough.” My naïvity at the time was simply on the burden of just fulfilling a quota rather than the truth of the matter. You have to sacrifice your time, your sleep, and a fair amount of your social life outside of the stream. Everyone has both good and bad days. The good are easy to stream. You sit and laugh and nothing can go wrong (except maybe drawing ten consecutive lands). You feel the strain in the rough days. Nobody talks about streamer depression, but it’s very real. Watching numbers go up and down, not making headway, or dealing with the stresses of everyday life make the bad days seem like pits of despair. It takes a toll on you to pull yourself out and try to stay positive. The important thing is to fight through it. I found myself in a unique position to undergo the challenge as a graduate student in electrical and computer engineering with enough ‘free time’ (I use that term loosely because it doesn’t truly exist as you do graduate work) to be able to play Magic every single day whilst balancing schoolwork, research, and teaching. Early on the challenge was much easier because the MTGO cube was available. Cube is my favorite format, and I found myself loving the stream and loving the community even more. Prior to this I had mostly just spent my time in the various Twitch streams of other MTGO players (NumottheNummy, GabySpartz, LSV, and HAUMPH to name a few), and had greatly enjoyed the interaction. Ultimately, the stream came down to a day-by-day basis. Each day I focused on playing whatever format seemed like the most entertaining and the most fun. A combination of lots of limited (Cube, Flashback events) with Modern and EDH to fill the time between rounds. Going to urgent care due to fungal poisoning. I got medication, drove home, streamed, then went back to the clinic to confirm I would be all right. Streaming while technically homeless. My new landlord thought I was moving in two weeks later, so I moved into my new apartment without locks and slept/streamed in the living room because the door was wide open. Streaming during multiple GPs (Detroit, Washington DC). After my sister (who was visiting) was stranded on the tarmac at O’Hare Airport for three hours, I drove through a blizzard to get home to stream. Who would have guessed that streaming every day would make me a better player? I also watched other streamers in order to learn all the older formats, so I learned a lot by watching, too. To celebrate the completion of a 365-day streaming challenge (read about that below), I streamed at twitch.tv/MrLuBuFu for 24 hours, starting at 8 AM Pacific / 10 AM Central/ 11 AM Eastern on Saturday July 9th. I wanted to raise money for Planeswalkers for Diversity (donate here). I love their mission to support everyone being welcome to this game, and I want to try and raise as much attention and money as I can for a group that deserves it. I have previously done 24-hour streams for various charities (Gamers Helping Gamers, Mariah Pagliocco Medical Fund Drive, and St. Jude). I think it is important to give back to this amazing community that offers so much to so many people. I also wanted to give back to the viewers, so every hour I gave away something to celebrate. Thank you all for the support. I am incredibly grateful to have had the opportunity and all the positive messages since I started the challenge. I hope to see you all this Saturday!